This fall the U.S. Navy ran successful testing of its first Laser Weapon System (LaWS). In 2016-2017 the navy intends to test the 100-150 kilowatt laser systems at sea, marking yet another breakthrough in the development of navy and regular weapons. Russia is also actively developing laser weapons, yet they are fully classified. The U.S. Navy recently announced that it has successfully tested its first laser weapon system. On Dec. 10 the navy reported that during the fall it had carried out a series of test runs of the prototype weapon aboard a warship in the Persian Gulf. The laser destroyed several targets mounted on a small boat and brought down an airborne drone. In 2016-2017 The U.S. Navy intends to follow up the initial success of the LaWS (Laser Weapon System), the result of seven years of development, by testing the 100-150 kilowatt laser systems at sea. The 30-kilowatt weapon uses a solid-state laser, and while it is not capable of striking targets at great distances, it is useful for hitting small flying objects at short and medium distances. Moreover, the LaWS can be employed to blind optical pilotless surveillance systems and ships. Paradoxically, the United States’ current success in the development of laser weapons has Russian roots. 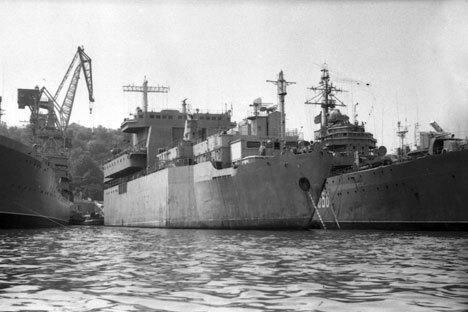 In 1995, after the partition of the Black Sea Fleet, Ukraine sold the U.S. a tanker named Dickson from an auxiliary fleet. The ship was sold at the price of scrap metal. In its holds the Americans found several 35-megawatt generators, special traversing mechanisms, refrigeration systems and lots of other equipment that made experts conclude that the ship had once had a laser weapon aboard. The U.S. and the USSR started researching the possibilities of using optical quantum generator-lasers in the military sphere in the 1960s. The Dickson tanker became the first ship from which the first employed laser weapon system was disassembled. Industry representatives recall that in order to receive the necessary energy to feed the weapon, 50 megawatts of electric energy were necessary. Therefore three additional engines from a TU-154 passenger plane were attached to the ship's diesel engines. The cannon was also used in full-scale tests. The constructors say that they were able to strike coastal targets and even winged missiles. Several seconds of action by the laser on a flying object would destroy the object by flooding it with air. The success was so great that the navy's administration ordered the laser cannons to be placed on the 1143 Kiev-type aircraft carriers. The euphoria soon turned to disillusion. In the course of testing, even though the laser cannon demonstrated its effectiveness, it was so “gluttonous” that it took only two shots to fully drain the ship of power. The analysis of the situation showed that if the 1143 aircraft carrier had been equipped with several of such systems, its anti-aircraft defense system would have been able to work only for five minutes. Afterwards, after having lost its fuel and electric energy, the ship would have become an easy target for the enemy's winged missiles and aviation. This is what "scuppered" the Dickson tanker from the auxiliary fleet. Dickson was not the only Soviet project in the development of laser weapons. The USSR was also working to create the Scythe apparatus, which would have carried the laser cannon and provided it with energy. The apparatus was supposed to be launched in 1987. But just before the launch Mikhail Gorbachev arrived at Baikonur and announced: "We are categorically against transferring the arms race to space and will lead by example.” As a result, work on all laser weapons development was curtailed by orders from the very top. The current state of Russia's laser programs is strictly classified, with only piecemeal information about the projects available. It is not known in which phase of development they are and when the weapons will be demonstrated. Former Chief of General Staff Yury Baluyevsky was tight-lipped when asked to comment on the development of laser weaponry in Russia. “One thing can be disclosed,” said Baluyevsky. “The development of military technology and the creation of modern forms of potential and effective armaments is evolving basically on the same level in all countries that have the opportunity to develop them." However, as Professor of Military Sciences Vadim Kozyulin points out, "the problem with laser weapons is that to function they require an enormous amount of energy. The main problem is to create a battery capable of feeding the laser cannon so that it can fire not one but several hundred shots." Moreover, lasers can only be used in certain weather conditions. They can't, for example, be used in cloudy and humid conditions. For this reason the LaWS were tested in the Persian Gulf, which usually has sunny weather, and not in Alaska with its fog, rain and snow. The future of LaWS is also foggy, however. The U.S. Navy does not say how many shots the system is capable of firing. There is no reliable energy source today capable of powering the mobile laser system for a long period of time, which is why there is presently no reason to exchange anti-aircraft missiles for laser cannons. "For now," notes Kozyulin, "the laser system's numerous tests are nothing but the study of the technology for the future.